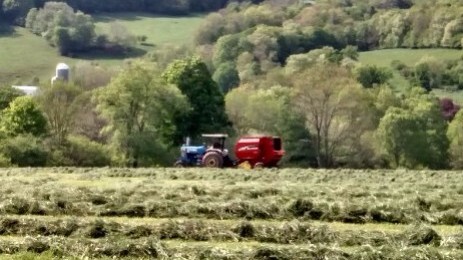 Hay harvest has been in full swing this week and crops have continued to advance in maturity. Orchardgrass and bluegrass were in early heading stage and both grass and legumes grew rapidly. Grass fields have past the target NDF and we recommend harvest of grass core acres as quickly as possible. We predict alfalfa fields will be at target NDF by early next week. Alfalfa/grass mixtures at target NDF and we would recommend harvest of these fields as quickly as possible. The return to more seasonable temperatures contributed to rapid growth of both grasses and legumes, both putting on 6 or 7 inches of growth this week. Fiber accumulation made up for slow changes the past couple weeks, advancing on average 2 percentage points per day last week. Once grasses reach 60 NDF the NDF goes up more slowly, but digestibility continues to decline rapidly. NDF digestibility decreased by 4 points and alfalfa decreased by 7 points, on average. This is typical as legumes are generally lower in digestibility than grasses. In general, NDF digestibility results this week are still in a good range, but will continue a steep decline as plants continue to mature. Second cutting was growing fast on several of the fields harvested last week. For fields harvested this week, plan for a high quality a second harvest of equal quantity in about 30 days. Remember for grasses leave a 4 inch stubble height to preserve plant energy reserves and promote a rapid regrowth. This also helps reduce the potential for bringing soil into the forage, raising ash content and predisposing for improper fertilization. Pest Alert: We are hearing reports from other parts of the state of armyworm feeding. No disasters at this point, but a warning to keep an eagle eye and try and catch any infestations before large losses happen. 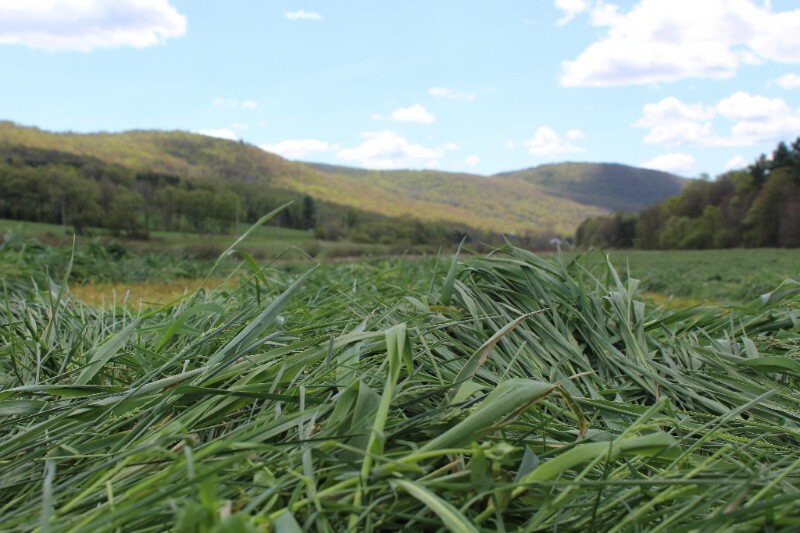 Bottom Line: All hay crops are at or past optimum quality, Harvest as quickly as practical. As I write this note, many farms have mown the first fields of the 2016 harvest season. Many fields sampled this week have NDF in the high 40’s. We expect these fields will be at target fiber content by the time you receive this message. Indeed, it is time for first cutting to begin. There were a couple grass fields tested in the lower 40’s that may not reach 50% NDF before next week, and fields with high legume content appear to be more than one week from optimum harvest. Grasses and legumes grew an average of 3½ – 4 inches over the week and NDF increased about 0.7 points per day. We will sample again on May 24, and send results on Thursday May 26. Mow with a 4in stubble height – less chance of soil in the forage, faster grass regrowth, and the little bit of yield you might gain is all low quality stems anyway. Pay attention to forage moisture (aka Dry Matter) – For bunkers shoot for 35% to 40% DM (65%-60% moisture), for Bags a bit dryer, and for baleage between 50% and 60% DM is best. Density matters – for bunkers, make sure you have adequate packing capacity, the faster the silage is coming in the more tins you need on the bunk, for balegae – dryer forage packs better, but however make bales as dense as possible. Cover/Wrap quickly – Get bunkers filled and cover as quickly as possible, wrap bales within 3 or 4 hours. Oxygen is the enemy of good silage, cover it quick and keep birds and rodents from spoiling the seal. Park the corn planter? – Unless you have labor enough to do two things at once, getting first cut done at the optimum time will gain you more than you may lose by delaying corn planting. Harvest your core hay fields at optimum stage and plant corn later. The results are in the chart below. Click here to download the PDF of the full report. We have a Factsheet: How to Interpret Forage Analysis that will help you understand forage analysis terms. 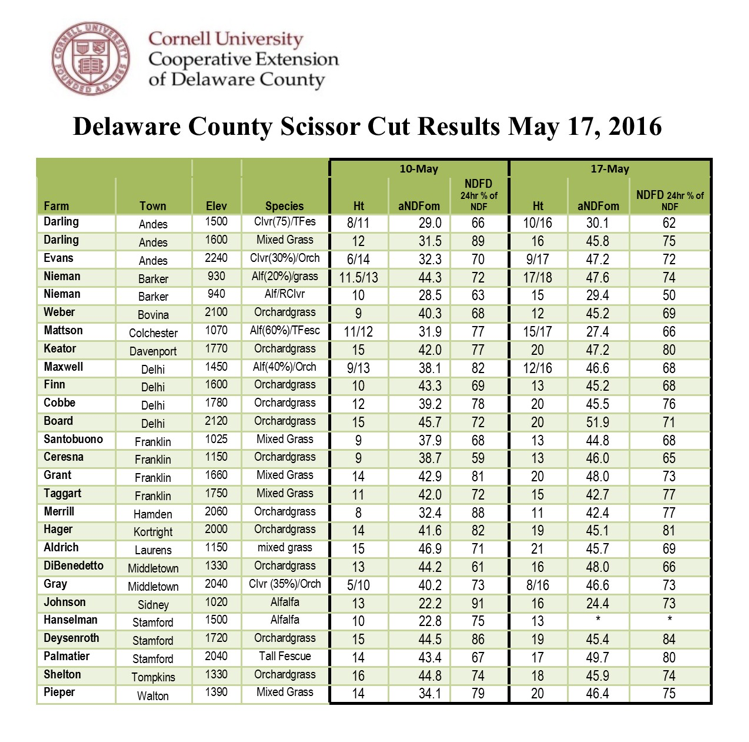 Below are the results of the Corn Dry Down Day in South Kortright on Thursday, 9/25. Ear maturity was on the average more advanced than last week, but dry matter was still below suggested levels for harvest on all the samples we tested. 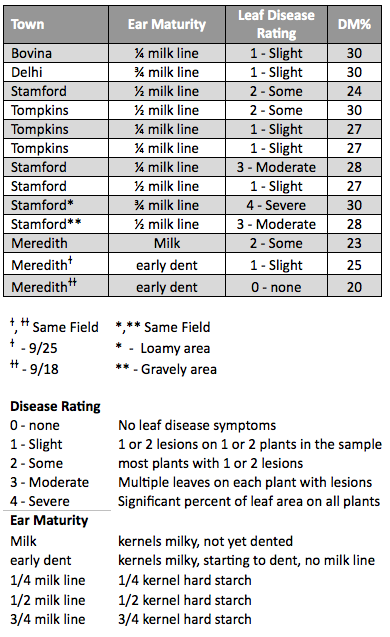 Leaf disease was more prevalent this week, with all samples having at least some evidence of disease. Two pairs of samples in the table below are from the same field; the town of Meredith field marked with ɫ is the only filed tested both weeks, the town of Stamford field marked with * was sampled in a gravely area and a loamy area. Both pairs of samples had differences in maturity, disease rating, and DM. Remember, the conventional wisdom is that the actual moisture, when the whole filed is harvested, will be about two (2) points wetter than what we get with our small samples. Below are the results of the corn dry down day in Franklin last Thursday. The conventional wisdom is that the actual moisture, when the whole filed is harvested, will be about two (2) points wetter than what we get with our small samples. With this in mind there were only a few samples that were close to ready for harvest, depending on the DM you need for your storage method. We would suggest 32% – 35% DM for a bunk, 34% – 38% for a bag, and 35% – 40% for a tower (the bigger the tower, the dryer). We found less leaf disease than last year, but you can see there were still a few with significant symptoms. We will be doing a second Dry Down Day at the Hanselman Farm in South Kortright on Thursday Sept. 25th 10 am – 3 pm. If you would like some help getting a sample, let us know.